We have an experienced shopper marketing and shopper understanding team and often have the opportunity to help clients with customer and channel-specific types of projects. Through our work, we help our clients gain or increase distribution, increase sales and develop new packaging or new products for particular channels. 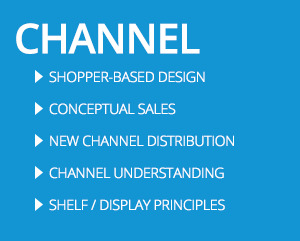 The need: Gain distribution in a previously ignored retailer/channel. To do this, we needed to convince internal people of the value of the retailer/channel and convince the retailer of the value of the brands. We needed to fully understand the retailer and the value the client’s brands would bring. Tradewind Group created compelling, data driven, internal and external conceptual sales. TRADEWIND GROUP | P 901.680.5192 | 7014 May Woods Lane | Germantown TN 38138 | © Copyright 2012. All rights reserved.